The Ultra-Low Emission Zone is not far away – are you ready? If you live in London you may already be aware of the ULEZ, but anyone who may travel into the centre needs to know what to expect. 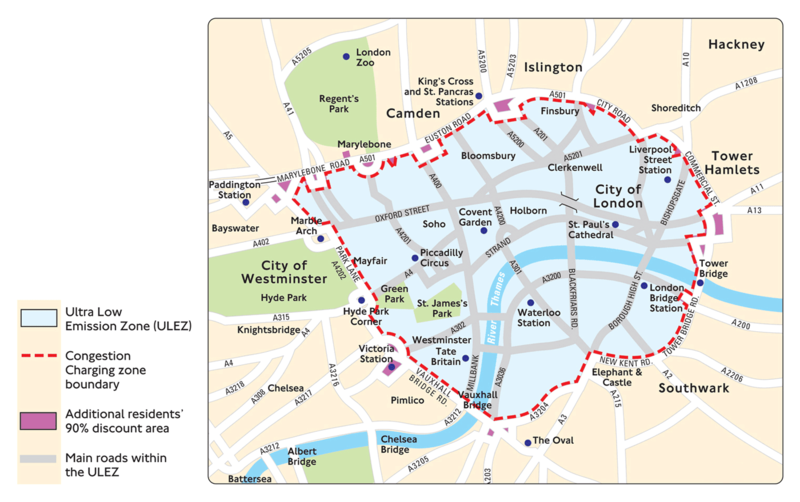 The ULEZ comes into play on 8th April 2019 and impacts many vehicles including cars and vans travelling within the designated zone. Within the area you these vehicles need to meet tight exhaust emission standards or else pay a daily charge to travel within the zone. The ULEZ is coming into place because of the ongoing challenge of air pollution London continues to face and road traffic is the biggest contributor according to the Transport for London. The impact of high emissions tends to hit our most vulnerable with children, elderly and those already with poor health hit the hardest. The pollutants from our vehicles make chronic illness worse, can damage lung development and even shorten life expectancy. The ULEZ is designed to reduce levels of Nitrogen dioxide and particulate matter that is emitted from our exhausts in order to make London a healthier and safer place to be. What area will the ULEZ occupy? From 8th April 2019 until 2021 the area is contained to the inner parts of London. Once 25th October 2021 rolls by the area will expand to the inner London are bounded by the North and South Circular roads. How much will it cost to drive within the ULEZ boundary? If you comply with the emission standards you won’t be charged. Otherwise, depending on your vehicle you will occur a daily charge. Which vehicles does the ULEZ standards affect? The ULEZ standards affect different types of vehicles in different ways. The standards for each type of vehicle is also different. Typically, older vehicles will have to pay the fees because they don’t meet low emission standards. Cars that are built today now abide by certain emission rules and have to meet standards before they are even allowed on the road. Euro emission standards currently range from 0-4 and 4-6. If your car is Euro 4 and above, it will meet ULEZ standards. Anything less than this will typically not. Check your vehicle meets the Ultra-Low Emission Zone standards. You can check if your vehicle meets with the ULEZ standards online. All you need to do is input the registration of your vehicle and you will be notified whether your vehicle meets the ULEZ standard or not. How will you know when you are entering the ultra-low emission zone? The area will be sufficiently sign posted so drivers will be aware when they are entering the ULEZ. This will include every entry point and will be below or next to the usual congestion charge signs. The system will use an automatic number plate recognition system so there will be no tolls or booths. Instead, cameras will automatically verify a driver’s registration and vehicle type and this will transport back to the Transport for London’s database to see if the vehicle meets ultra-low emission standards. There are some vehicles that will be subject to discounts. For residents of the ULEZ, there will be a discount available for a short period when the zone comes into place. This period of time gives residents the chance to change their vehicle if they do not meet emission standards so that they will not have to pay the emission charges if they are currently exempt, it will be a 100% discount during this time. There will also be a similar exempt period for disabled drivers or disabled passenger vehicles. They will be exempt from the ULEZ charges until October 2025. London taxi’s that are licensed are also exempt from ULEZ charges, subject to a 15 year age limit.